Haarlem has frequently been voted “Best Shopping City” in the Netherlands, and its easy to see why! Haarlem is a popular city for shopping in North Holland. In fact, people come from all over the Netherlands – including Amsterdam – just to shop in Haarlem. The city has deservedly been voted Best Shopping City in the Netherlands many times. Haarlem boasts a diverse range of shops, from fantastic small, quirky boutiques to concept stores to the usual Dutch department stores (HEMA) and chains (H&M, Zara, Esprit). Haarlem’s compact centre makes it perfect for window shopping and browsing. 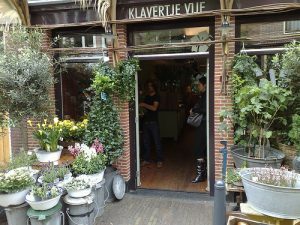 Haarlem is famous for it’s charming shops – like the lovely Klavertje Vijf. Much of Haarlem’s shopping is in picturesque pedestrianized (traffic-free) zones. The Grote Houtstraat is Haarlem’s main shopping street and has most of the usual high street retailers. The streets and alleyways surrounding the Grote Houtstraat, like Kleine Houtstraat, the Warmoesstraat and Gierstraat have Haarlem’s smaller independent stores and boutiques. Here you can spend hours just browsing or buying anything from high end bicycles to handmade children’s toys. The friendly retailers are happy to advise or leave you to discover the shop on your own. In the opposite direction from the main centre, but still only a 5-minute walk from Haarlem Central Station, Haarlem’s General Cronjestraat is a retro shopping experience. Small ethnic grocers rub shoulders with trendy barber’s shops, there’s a wonderful independent toy shop and some lovely clothing stores too. In fact the Cronje (as it is affectionally called) is the longest shopping street in the Netherlands and much of the pavement is covered – so you can stay dry on rainy days. Market days are also held twice weekly in Haarlem, with wonderful fresh bread and lovely vegetables enticing you to sample the goods. The largest market is on the Grote Markt square, under St. Bavo Cathedral, and is held on Monday and Saturdays. Markets have been held on this square since the middle-ages and here visitors can really soak up Haarlem’s atmosphere. In general, shops are open from Monday to Saturday. Opening times usually are from 9am to 5pm, except on Monday’s when shops open at 1pm. Many shops in Haarlem’s city center also open on Sundays too (Koopzondag) and shops are often open from 7pm to 9pm on Thursday evenings (Koopavond) as well. A really handy website for checking (in real time) whether shops, restaurants – or pretty much anything is open anywhere in the Netherlands is openingstijden.com. Try the search box or browse through the list for inspiration. You’re bound to find some gorgeous wares in Haarlem, but if you don’t have time to hit the shops looking for the perfect gift or souvenir from Holland, then why not check out Visit Haarlem’s store and shop online? Our partners usually ship overnight, so you could have your purchases delivered to your hotel.